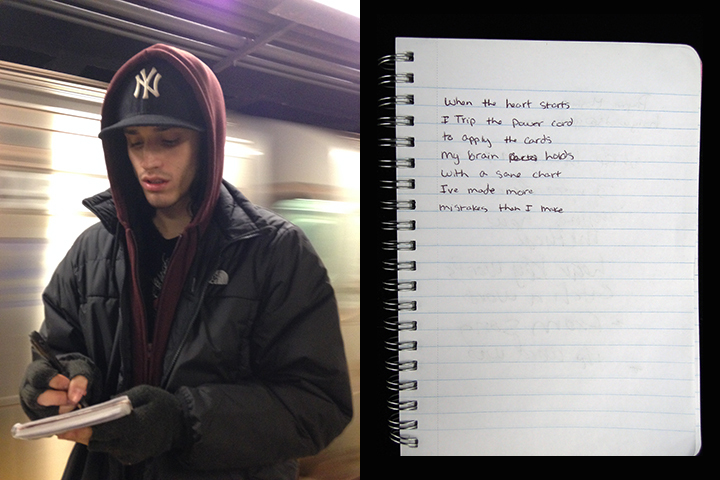 Dr. Zizmor Trip Poem: body whirlpools: Sebastian C.
He had a big blank lined notebook and he was getting ready to write. I wanted to ask him then and there, but he was so obviously pregnant with words that I felt it would be a disrespectful interruption. A few stations later I looked over the heads of my neighbors. He had written something on the left page. It looked like poetry. Finally he put the notebook away. By then I had lost my mojo. I picked up my book: Why Women Think Too Much. It said that women can tend to not ask for what they want, that one negative thought can lead to many. I reminded myself that interacting with strangers makes me happy. I got up, leaned over and asked him. I have seen this many times before – the transformation in the stranger’s face. When Payson realized what I was asking, he put on a thousand watt smile. That is the moment of connection. I cannot even describe what it is, but it is something very human and very special. “Talking to you got me thinking “What If” a lot. What if I decided to just bump to my music? What if I decided to read one of my books. You might’ve still came up to me, but you also might not have. As well as, what if I could’ve written something a little better? That he ain’t even alive in. Read a poem by Gabrielle V.